Rolling hills became rolling mountains. The steep lines up and down in the elevation profile for this section describes the challenge involved; needless to mention the rewards of downhill riding and the awesome views. After all no pain no gain. During my short stay at Cali I visited Universidad ICESI for a motivational talk. Carlos whom I met through my friend Maria was an excellent host. He introduced me to several of his staff members and I also had the pleasure of cooking a big curry for some of his friends which gave an excellent opportunity to learn about the history, politics and education system in Colombia. 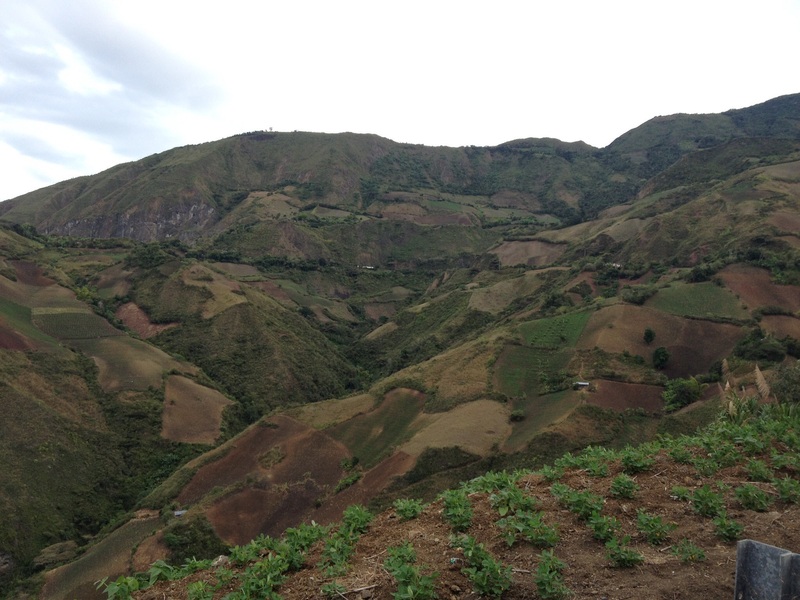 My sincere thanks to Carlos who was also in regular touch with me via phone for the following few days after I left Cali since this part of Colombia was a bit desolate and in the past had some safety issues. My experience of this section was different though: numerous ascents and descents, hot weather and things were getting cheaper. Even the sections that look flat on the elevation profile had numerous short climbs and I must admit it was quite tough on my calves. I will let the pictures describe the landscape. 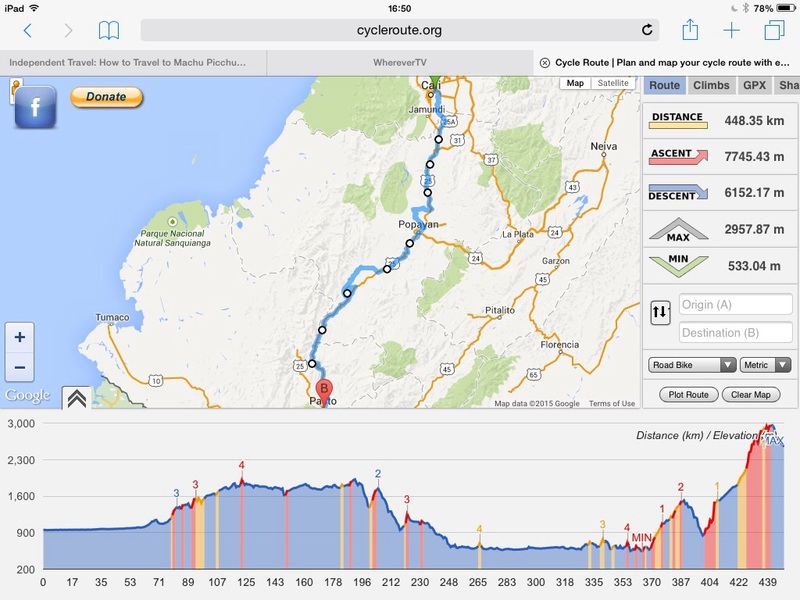 After Cali the next biggest town was Popayan, dubbed as white city, was two days ride away. From Cali, after an exhausting ride in the hot sun, punctuated with trailer wheel puncture issues I arrived in a town called Pescador which did not have any hotels. I camped in the front yard of one of the locals which unfortunately was next to a discotheque. For a little village that does not even have a hotel, the party scene was unusual considering it was A Sunday night. The loud music went on until 4 am. 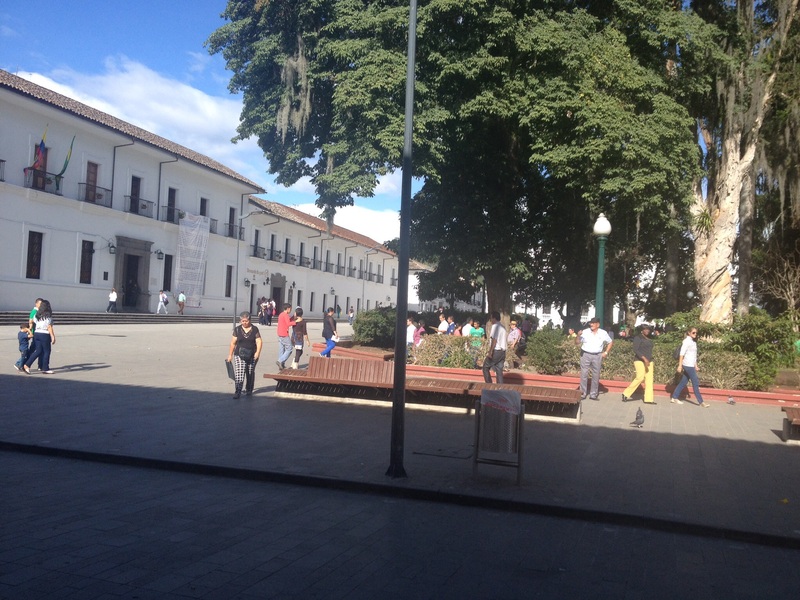 Fortunately the next day was a just a short ride to one of the touristic towns in Colombia, Popayan. As the nick name implies the buildings in the historical town centre were all painted white which, I learnt, it’s in fact a legal requirement by the local government. 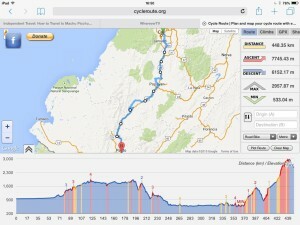 Popayan to Pasto was a four day ride with very little traffic. Early start is one way to tackle the heat. Also 6 am start meant I arrived around mid-day at my destination and had plenty of time to explore. Pasto was at 2500 metres altitude, 45 kms of climbing startingat 800 metres. There was a small hurdle in between; another 1600 metres mountain to climb over. The first day ride from Popayan to El Bordo had some rolling hills in the beginning but more downhill towards the end. 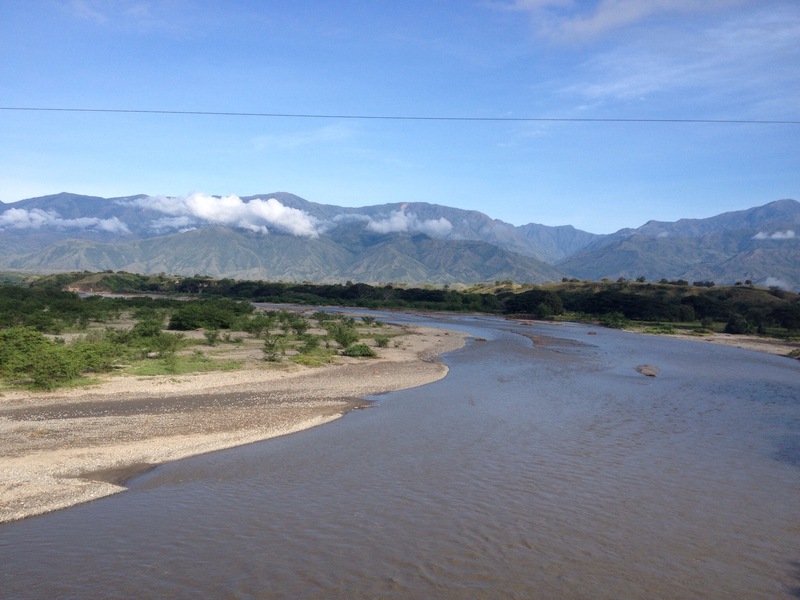 The second day, El Bordo to El Tablon was a long day as expected especially the last 10 kilometres ascent in the hot sun. Fellow cyclists should note that this section is quite desolate and it’s probably better to stock up on supplies (water, food). 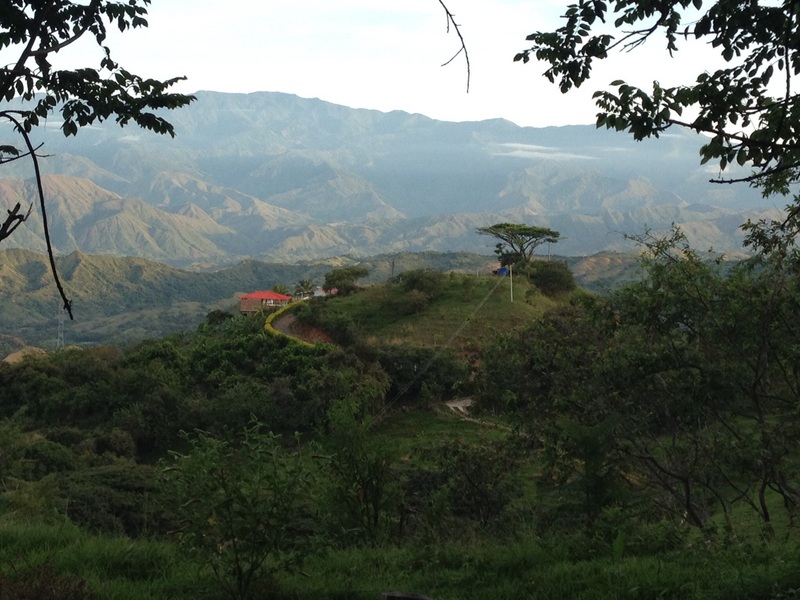 El Tablon was just a truck stop village, nothing much there but the hotel where I stayed was just 500 metres before the village and it was located at a stunning spot. 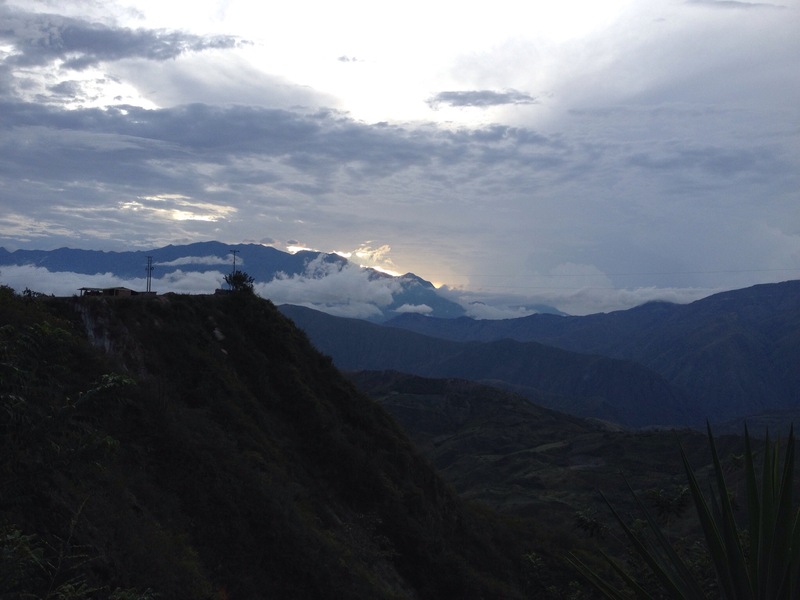 The views from this place was spectacular and the hotel costs just 5 USD. I wish I could have stayed here for another day. In Europe, accommodation in a spot like this would make a big dent in the wallet. 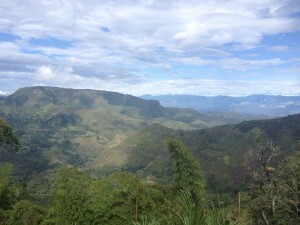 On the third day from El Tablon there was a 5 Kms ascent to the top at 1600 metres followed by a 13 Kms descent which no cyclist would want to miss. The view that opens up on the top exposes the long downhill. The road seem to just cling to the side of the mountain and the view of this road that leads up to a short tunnel had to be caught on a camera. Have fun while it lasts because the mountain will claw back all the descent. 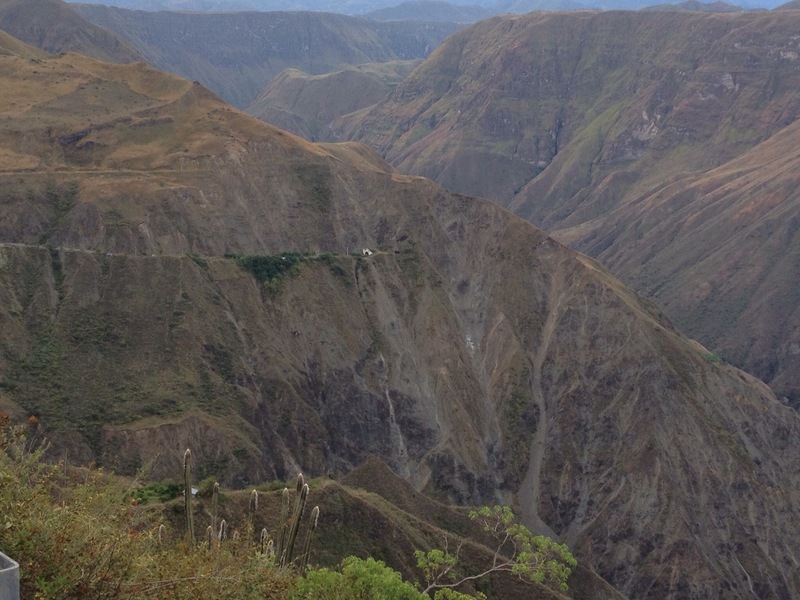 From the lowest point at 800 metres its 45 Kms of climb to Pasto. Not all of this could be done in one day so I stopped in a place called Club de Policia, in the town Chachagui. Cyclists wanting to stop here should ask around for this place since it had no signs. Again, for a 5USD this place was a good bargain and it included a swimming pool. 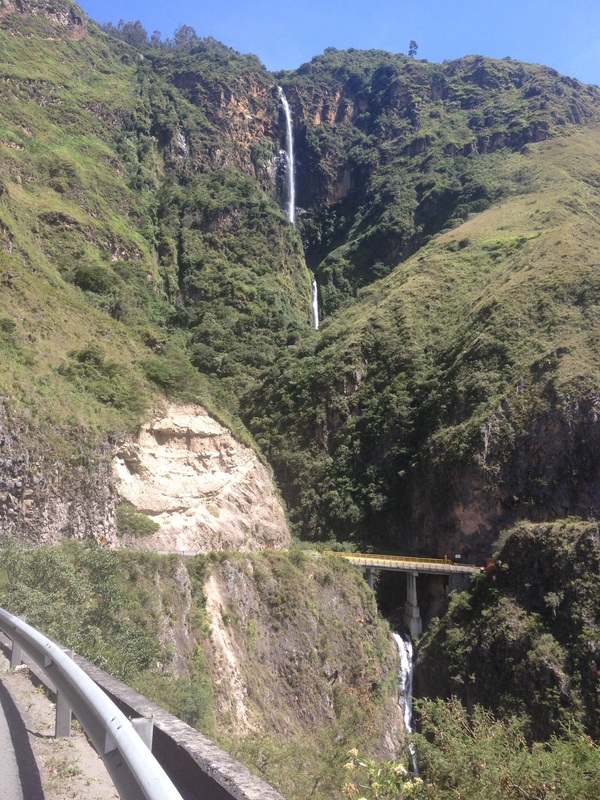 Chachagui to Pasto was only 29 Kms but it ascends from 1900 to 2900 metres altitude before descending to Pasto. 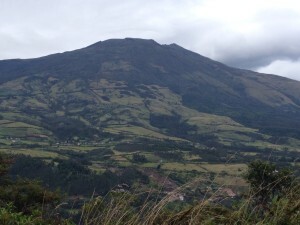 There was an active volcano called Volcan Galeras that could be seen before entering Pasto. I hope the houses that were built below this volcano were lava proof! Pasto to Ipiales, the border town was 86 Kms away. After leaving Pasto, there was a non-stop 13 kilometres ascent to an altitude of 3200metres followed by an unforgettable 27 kms downhill to the small town called El Pedregal at 1700metres altitude. 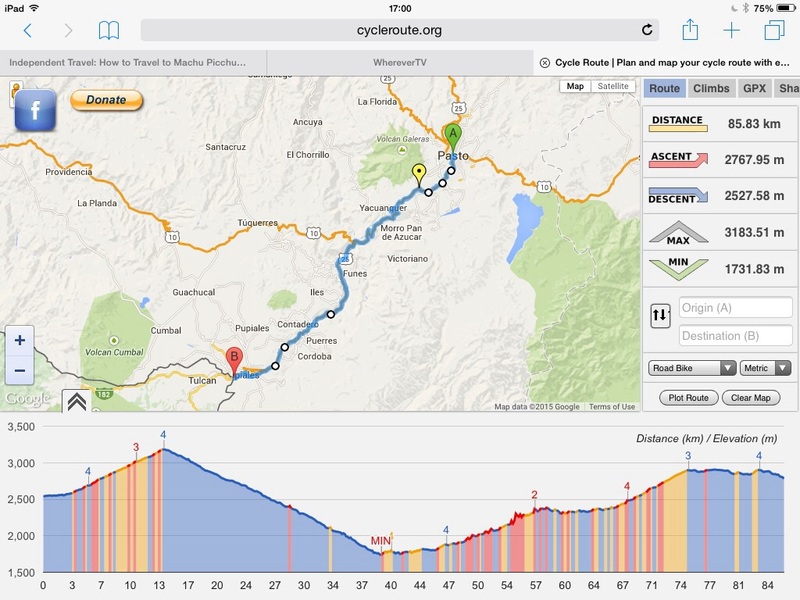 Almost most of the altitude that was lost had to be regained since Ipiales was at 2950 metres – some hard work ahead. There was a spectacular waterfalls, cascada Humeadora, around 15 kms from El Pedregal. This was not a tourist spot so no buses or cars stopped here. 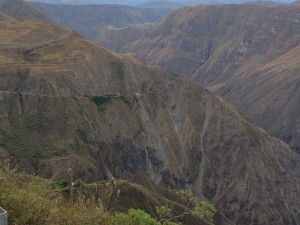 The water drops from a neck breaking high altitude and into three sections, top middle and bottom. It was hard to capture this on one single shot so I took a short video posted here. I needed some recovery time after all the climbing a rest day in Ipiales was inevitable. 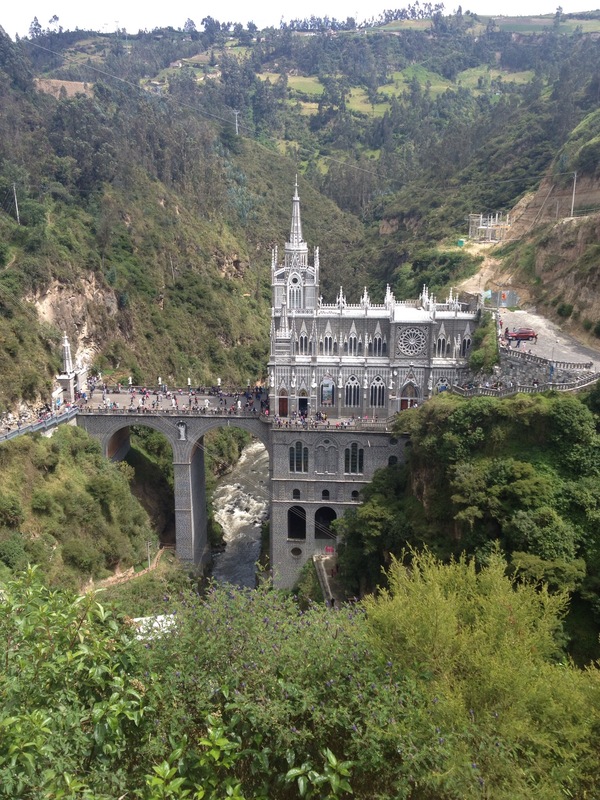 It ended up a bit more than a rest day, lots of walking to visit one of the most famous churches in Colombia built in a canyon. The architecture of this place was mind blowing. I had two deadlines to meet, one of them was self-imposed though. The first one was to leave Colombia by 4th of May and the second one was to reach Quito in Ecuador by 6th May to watch the UK election results live on the 7th of May. I realised the silly mistake that I had made when I arrived at the border. The immigration office included both the day of arrival and exit for their calculation but I didn’t. According to them May 4th was the 91st day since I entered Cartagena in Colombia on a 90 days visa. Even though I arrived at 7am on the 91st day the immigration officer refused to stamp me out because his computer said I had overstayed my visa. He passed me to his higher office who made me wait 4 hours before pardoning me for my mistake who asked me twice to pay a fine of 150 USD which I thought was a bit steep considering I had not overstayed my visa by more than a few hours. Thanks to internet, I read during the waiting period that the officer has some discretion to waive this fees. My patience and persistence paid off. 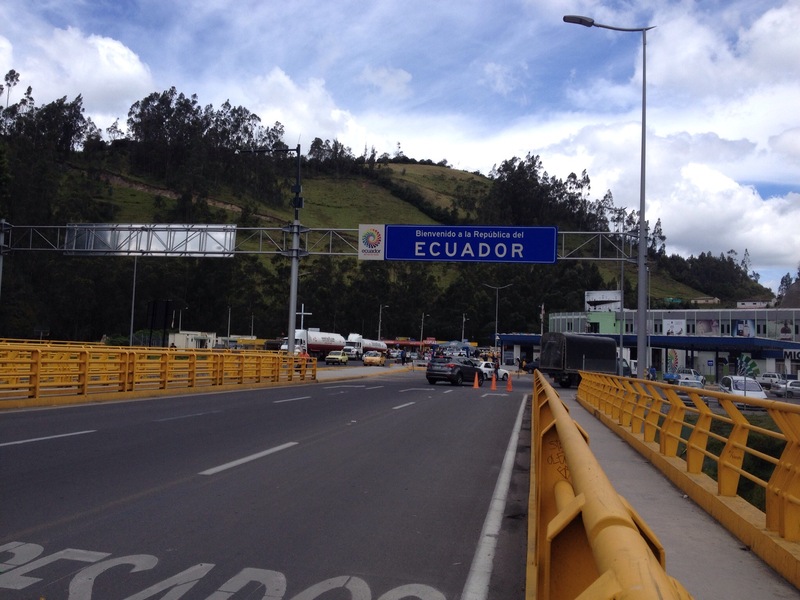 I crossed into Ecuador around mid-day. I only had three days to get to Quito which was only 250 Kms away although the theme of ups and downs continued. 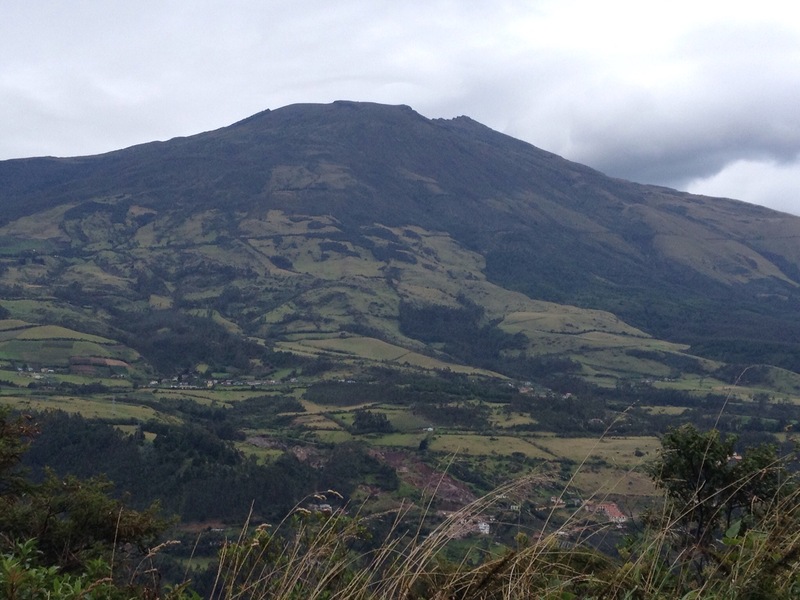 I had to climb up to 3000 metres twice in these three days. Having lost lot of time in the immigration office, the first day was a short ride to San Gabriel and the second day was 110 Kms and 96 Kms on the last day; some tough riding on the mountains. 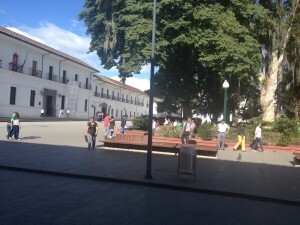 For the second night in Ecuador I stopped in an interesting town called Otavalo, a pretty historical town with lots of colonial architecture and stone paved streets. 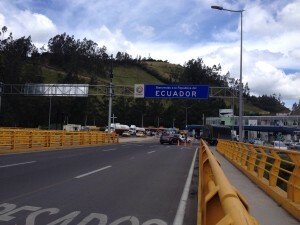 I crossed that imaginary line called Equator somewhere before Quito and I am now officially in the southern hemisphere. Perhaps I underestimated the intensity of sun close to the equator. I should not have used a sleeveless top. However while watching the election results on the 7th of May, I felt the sun burn, the aches and pains endured over the last few days were justified. 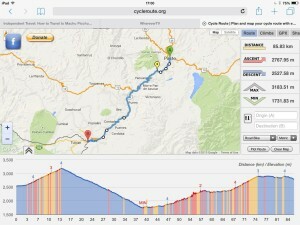 So many km and so many meters of altitude gain every day!!! Wow awesome hills. Come to France for three weeks in July – you’d cruise the TDF! That was some intense and spectacular cycling! Well done. I have put it on my to do list! Wow, it looks amazing! Congrats on tackling all the climbing too. Thanks for sharing your experience and photos. Don’t know if you can help, last year I caught a bus from Ipiales to Cali. 2-3 hours into the journey, winding up some incredible scenery we were approaching the top (somewhere!!) and came around a hairpin bend and there was a driveway on my left with a large sign saying Hotel. It would have had one of the most spectacular views I have ever seen. 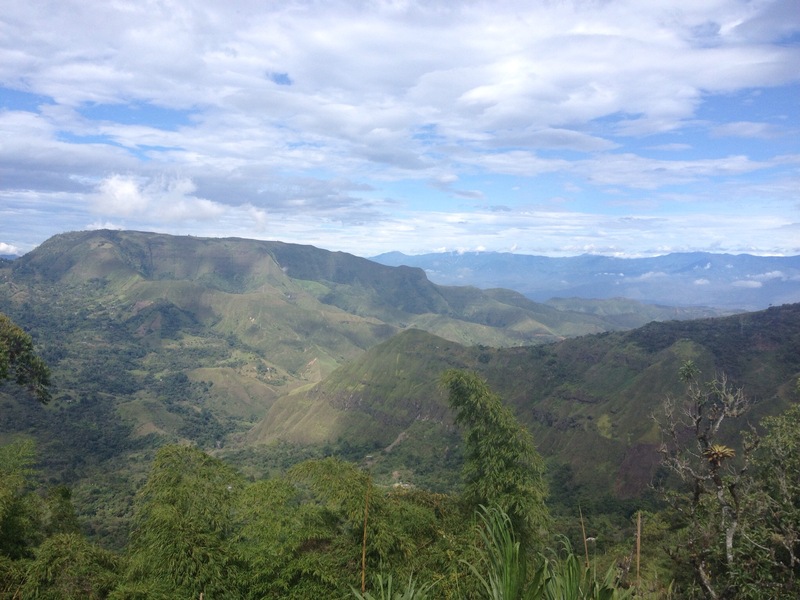 I am going back to Colombia in 2018 and am dying to find that hotel – even just to stay one night and soak in that amazing view. 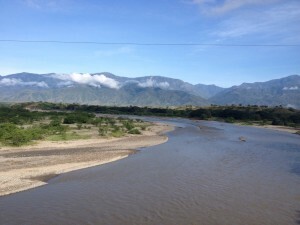 I have read your blog and thought it may have been where you stayed at El Tablon. 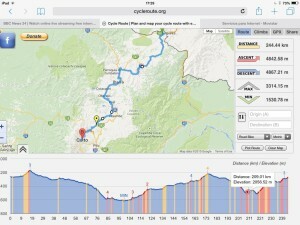 However, going from north to south you would not have climbed another 5km when you continued your road trip. I am guessing the hotel I saw would have been towards the start of the 13km descent. I don’t suppose you can give me any idea on the location and/or name? Hi there, I am including the link for the map here where you will see the village Pubelito El Tablon Gomez. I went to street view to look for the name of the hotel. It says ‘Hotel’ and there is no specific name for it. There was a shop nearby which you can see on google map called ‘Estadero Orence’. The hotel was right next to this shop. If you go to street view you will find both the shop and the hotel. It was a stunning place indeed. Going from popayan, after El Bordo and Cumbitara this hotel is about 500 metres before the actual village. Hope you find this place and if you happen to stay there, say hello to them. They were brilliant people and its a very calm and relaxing place. You can also search for this village and go to street view to find this place. Thank you so much – presume that is the hotel that you stayed at. 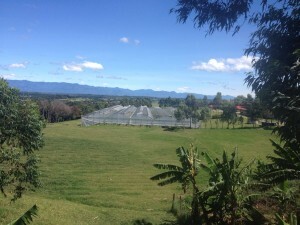 When you rode to the top of the hill then started the downward descent (13km), did you see another hotel – it would have been on your right on a hair-pin bend and I don’t think it was too far from the top of the hill. 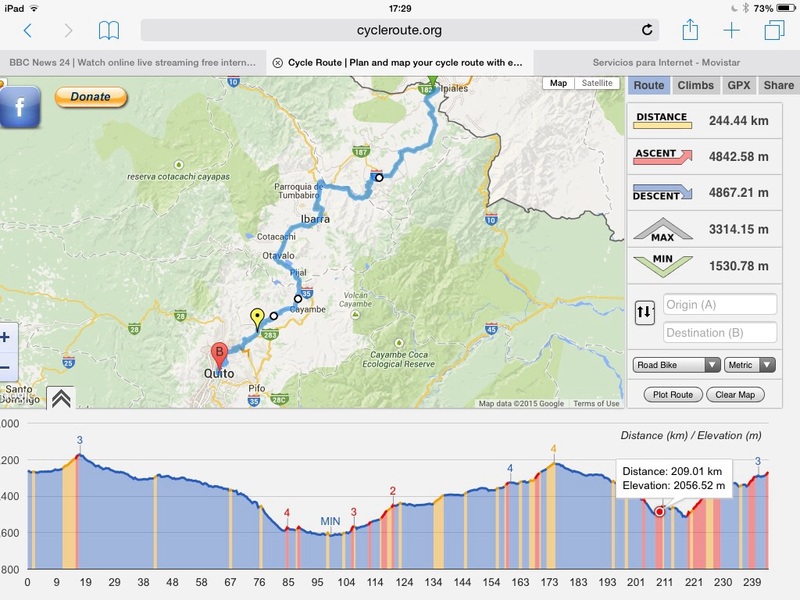 From the link you sent me, when you started riding in the morning, I assume that was towards the bottom of the screen (south). If I keep following that road on Maps then I would get to the top of the mountain after 5km. I was captivated with the brews that this hotel would provide and am determined to find it and stay there in June! Yes, that is correct I stayed in the hotel shown in the map I sent. I don’t remember the hotel that you mention since its now more than two years ago. But the whole area was just beautiful and quiet. I do hope you stay in that area and write to me afterwards!